The ultimate goal of setting up GIMBC is to develop young intellects capable and motivated to do excellent neuroscience research on mind and consciousness, pursuing the research excellence, enhancing the visibility and competence of TMU in the field of mind and consciousness. To answer this goal, we design our courses based on the following aims. Cultivate young scientist-scholars who integrate experimental and clinical work, drawing upon the influence of neuroscience, psychology, and philosophy. Considering students coming from different majors and different countries, their backgrounds can be diverse, so the courses are designed as three steps to develop students’ research motivations on mind and consciousness. The three steps include (a) pavement of neuroscience background, (b) training of neuroimaging techniques, and (c) application to public health and clinical pathology. Along the three steps, the students will learn step by step to collect special knowledge to the brain science and realize what they can do from (a), and then learn how to do from (b). Finally (c) is to contribute their knowledge to assist clinical diagnosis and to boost public mental health. 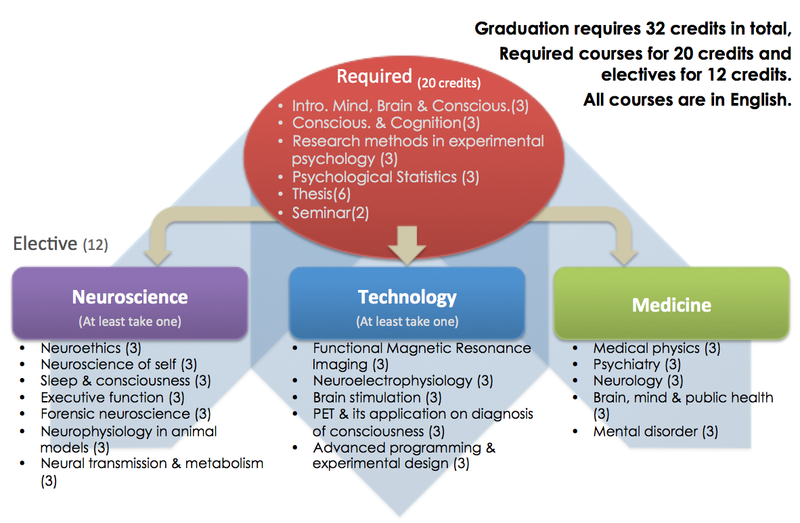 In the course design, the graduate students not only can develop excellent skills toward mind/consciousness researches, but also do they develop enthusiasm and motivation with clear visions by taking practical projects and clinical internships from the courses and collaborate with medical doctors in TMU system. Develop experts in the study of mind, brain, and consciousness, who are capable of carrying out scientific projects of high quality that involve advanced neuroimaging technology. One of emphasis of GIMBC lies on the knowledge of “how to conduct excellenty research”. Therefore, we request (a) every student learns how to design experiments for consciousness. To disentangle millions of unknowns about the mind and consciousness, the first step is to set up a solid background on clarity of goals and strategies. Therefore, students will be asked to enroll multiple experimental design and data analysis courses held by qualified faculty members. (b) every student learns at least one specialized neuroimaging technique ex: EEG、TMS、fMRI、MRS、PET、tDCS. We believe that research techniques are the foundation allowing further understanding of the brain. Therefore, practically to consolidate the research expertise for young junior scholars, we will ask students to choose one major technique in the neuroscience field and major on it. More important of all, the students will learn how to collaborate with each other by understanding the pros and cons of each neuroscience modality and building up a research team. (c) The courses are designed to involve hands-on research & will publish international Journal before graduation. Because all graduate students will be requested to involve in research that is published in international journals, they will enjoy shared authorship on these publications; thereby enhancing their employment credentials. Demonstrate the relevance of this instruction as well as training to clinical applications and public mental health, so that students can apply what they learn to clinical contexts, such that in this and other ways they are able to contribute to public health, with a special focus on neurological and psychiatric problems. GIMBC courses are mostly designed to be problem- or project-based learning, linking theoretical ideas with practical mental problems in the real life, and verifying the ideas in neuroimaging experiments. In this design, trainees will be suggested to think through the abnormality of brain functions and the impact of the clinical pathology (e.g., forensic neuroscience, or sleep and consciousness). In class, trainees will be asked to collect the mental issues from their friends or relatives to enhance their consideration on the impact of mental illness to the society. Furthermore, we will invite medical doctors for lecturing the clinical topics about disorders of consciousness in the Psychiatry and/or Neurology departments. Practical clinical participation in the Radiology department and direct interactions with patients will raise students’ observation of the inability and inconvenience for the mind/consciousness problems. Under the situation, we anticipate that trainee’s empathy will guide them devoting to issues related to the public mental health problems, finally contributing to the entire society.